'I feel it in my fingers, I feel it in my toes.. Love is all around me, and so the feeling grows'party with a twist! We welcome everyone to celebrate a night of the iconic film... 'Love Actually' to a night of extravaganza and euphoria. Billy Mack will be hosting the party and supplying the anthems. 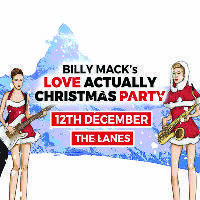 Boogie on down to The Lanes, for a night of Love Actually anthems, Christmas bangers, accompanied by your favorite 70’s, 80’s and 90s smash hits. Fancy a side of bowling whilst partying? Well, we got you covered my friend.